Can I post it on the web? For commercial use? For any use? Is it Green? Or Gold? BOAI compliant? Or something else? How did you tell? Is it gratis? Is it libre? If so what permissions have been relaxed? Can I send someone a copy? Anyone? Or just a non-commercial? Does its location affect whether it is Open Access? Has someone paid for Open Access? Would their funders be satisfied? 5 Responses to Is this paper Open Access? 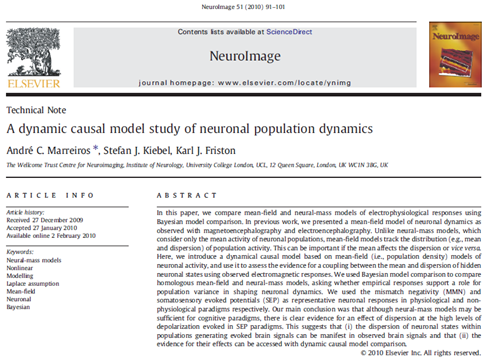 The article is in the PubMedCentral Open Access subset. The PMC xml file provides a link to the license terms: http://www.elsevier.com/wps/find/authorsview.authors/supplementalterms – this page states the terms fairly clearly (compared to so many other licenses I’ve see). The license is not a standard license. It has non-commercial clauses. It is Gold in the sense that someone paid extra to get this to be “OA”, but it is not BOAI compliant and hence not what I would call Gold OA. I cannot say if their funders would be satisfied – you’d have to ask the funders. It is gratis as I and anyone can download it for free, but not libre as I cannot use it for all lawful purposes due to non-commercial clauses. You can pass on a copy to anyone you like, provided that you are not doing so for a fee or show advertisement. This is a wonderful answer. I won’t comment at this stage because I’d like other views. I’ll note that you had to go to Eu/PMC to answer the question. From the image you linked, the only information about copyright I can see is the “(C) 2010 Elsevier Inc. All rights reserved.” This seems to imply that the article is not open access. If there is no way to tell from the PDF file if it is copyright or not, how are you supposed to know if you are allowed to redistribute the file? However, given that the paper is from the Welcome Trust Centre for Neuroimaging, I suspect it might be open access given the trust’s stance on the issue. >>From the image you linked, the only information about copyright I can see is the “(C) 2010 Elsevier Inc. All rights reserved.” This seems to imply that the article is not open access. >>If there is no way to tell from the PDF file if it is copyright or not, how are you supposed to know if you are allowed to redistribute the file? This is the point of the question. Many people will assume they aren’t allowed to redistribute it. >>However, given that the paper is from the Welcome Trust Centre for Neuroimaging, I suspect it might be open access given the trust’s stance on the issue. Excellent deduction Watson. Logical, but not necessarily correct in fact. Pingback: NIF Blog » Blog Archive » Are You Sure You Published An Open Access Article?